In you have a page copied from other website or copy form generated content, and that page is indexed by Search Engines, you’ll be penalized by Google Algorithm Panda. Penalized by Google Algorithm is bad impact to your website. What can do noindex and nofollow meta tag for your blog? 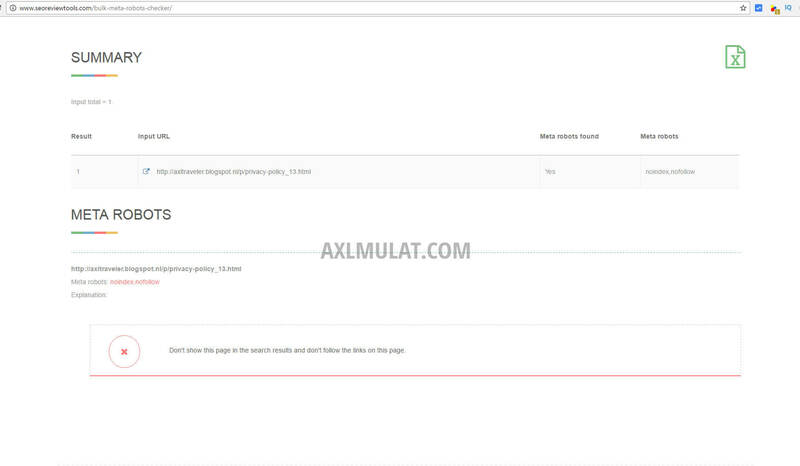 In my website axlmulat.com i also apply this method in these page specially Sitemap Page because it doesn’t important to indexed on Google. Adding It’s a very simple, to avoid mistake kindly read clear the instruction and let’s get started. This tutorial is part of the Blogger SEO for Beginner Course in My YouTube Channel, Like this post? kindly like and share to your friend, thanks for reading clearly.